An adventure game made in a visual novel style with elements of dating sims and jRPGs, created by Pure Wish studio. The story of Song of Memories is focused on two high school students: Minato Kamishiro who is raising his sister and his friend, Kanon Hiiragi. Song of Memories is a visual novel with date sim and jRPG elements. The game, developed by Pure Wish studio, is available on various platforms, e.g. PC, SWITCH and PS4. The plot of Song of Memories focuses on two Japanese high school students – Minato Kamishiro, orphaned at a young age and currently raising his younger sister Fuuka, and Kanon Hiiragi, his best friend who suffers from poor health. The lives of those two friends gain unexpected momentum when the world suffers from a dangerous virus that increases violence in women that are infected by it. In addition to that, a new person appears in their lives – Akira Tabunoki who is having her medical investigation. The friends also find a mysterious smartphone with an application called Dream 4 You. When they run it the screen displays five girls that addresses Minato directly by saying that they can gladly help him whenever he is in danger. What is the reason behind all of this and what roles our heroes must play in the story – all of the answers for those questions are discovered during the game. The gameplay in Song of Memories is the same as in other visual novels. The main focus is on following the story – during the game we watch scenes in which we can see silhouettes of characters that participate in them; by using a system called E-Mote, the developers were able to add a little bit of animations to the sprites which makes them more expressive than usual and static illustrations in most of the visual novels. To make things more interesting, the game also has tactical, turn based battles during which we can use our heroes' unique abilities. 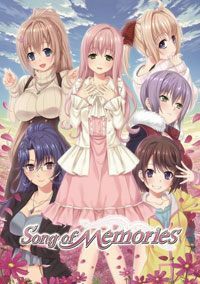 Song of Memories', released on PC, SWITCH and PS4, strong points are good graphics made in manga style and fully voiced dialogs. Also, the soundtrack that consists of thirty tracks can be viewed as another plus.